Happy Friday! Has fall arrived in your part of the world? It has in mine. Leaves are raining down and the beautiful golds, reds, and yellows are quickly fading into a memory. I love fall and this has been one of the best I can remember. I am thankful for the change of season. In the summer we BBQ more, eat more cold dishes, salads, and ice cream. But now that fall is here I like settling into comfort foods that bring warmth and smiles all around. 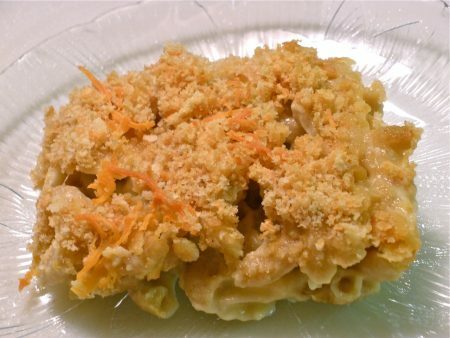 Earlier this week my husband remarked that a baked macaroni and cheese sure sounded good. He had been eating his own cooking for the past 10 days while mother and I did some traveling and so I am quite eager to oblige him! I have several macaroni and cheese dishes that we like but today I settled on a Three Cheese Macaroni that blends the best of sharp cheddar, Pepper Jack, and Gruyere cheese. Gruyere is a fabulous cheese for baking. It sweet but has a slightly salty flavor it is a good melting cheese. 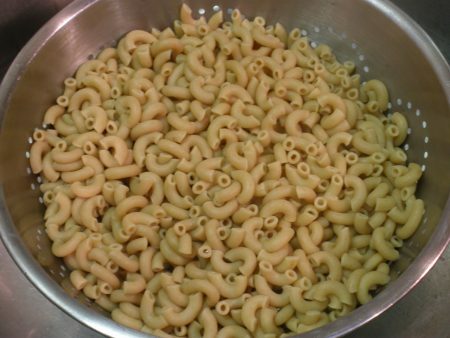 I always try and use whole wheat pasta so you will see the macaroni is a little darker than white macaroni. 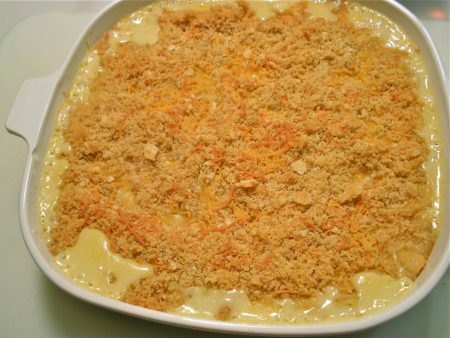 Macaroni and cheese is one of those main dishes that you can easily dress up with the addition of meat (sausage, hot dogs, ham) or throw in some chopped broccoli for flavor and color. Because my husband is quite the purest when it comes to the seriousness of Mac and Cheese, I made the bulk of it pure. But I couldn’t resist spooning a bit into a small dish, adding some leftover cooked Jimmy Dean sausage and topping with a bit more cheese. Mom gave it a thumbs up and I enjoyed the added flavor as well. Baked macaroni and cheese starring sharp cheddar, pepper jack, and Gruyere cheeses. In a large saucepan over medium heat, melt the butter. Whisk in the flour, then add the onion powder, garlic, salt and pepper. Gradually whisk in the milk. Cook, stirring constantly, until the sauce thickens and the mixture begins to bubble slightly. 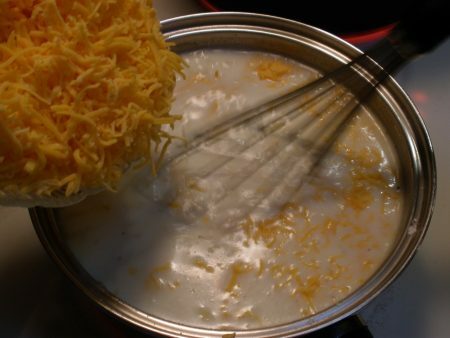 Add the cheese and stir until the cheese melts. Add the cooked pasta and stir to coat the pasta. Cooked sausage, cut up hot dogs, diced ham, or chopped broccoli would all make great optional ingredients for this one dish meal!